If you have read my blog, you will know that I am a big skincare addict and love trying new products out. 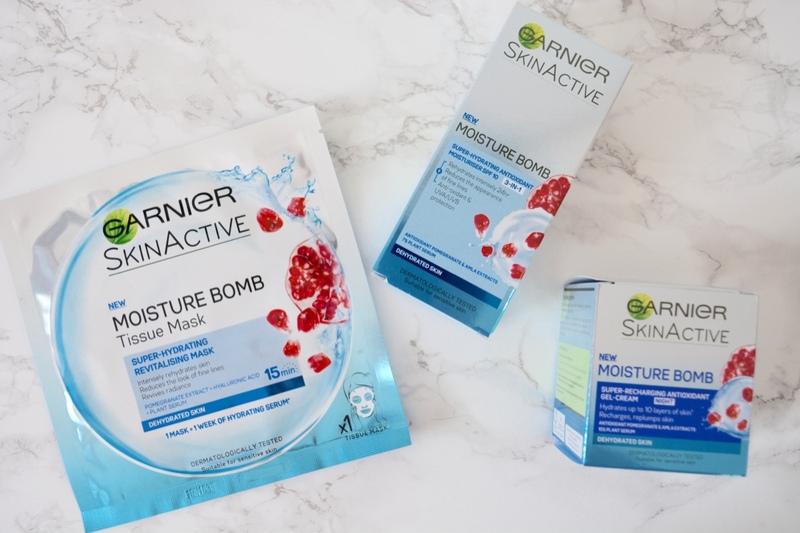 There are very few brands that I repurchase an item in or try more than one product in their range, however, Garnier is one of the exceptions to that rule. I love Garnier's products and I genuinely think they are amazing, I have pretty much tried out most of their products and I swear by their Micellar Waters. 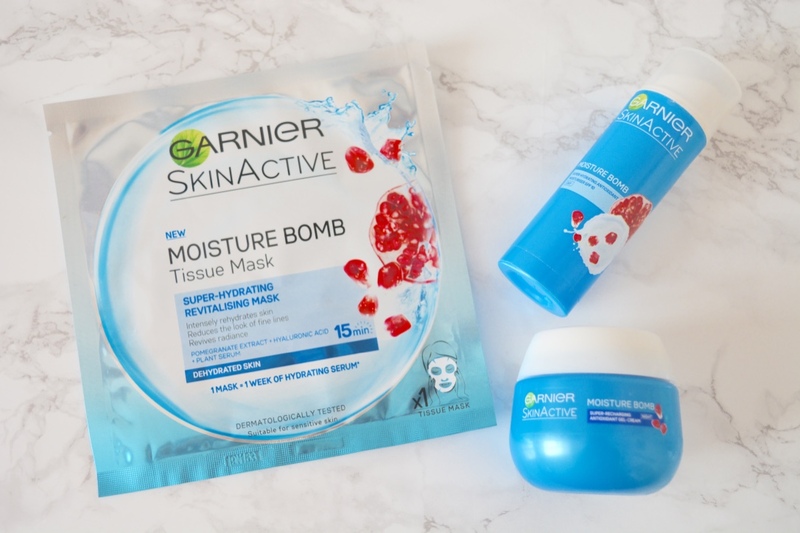 When I first saw the Moisture Bomb range, I was really excited to discover more about it especially since it is targeted at helping hydration and restoring radiance. This range is perfect for Autumn/Winter and I could not have bought it in better timing, it is great for preparing your skin for the colder months and the change in harsh temperatures. Sheet masks have become massive in the last year, the trend originated in Korea and since coming over to the UK it has just continued to grow. Realising how popular the trend is, most brands have released one and it is interesting to see the difference across all of the different masks. I had been itching to get my hands on the Garnier Sheet Mask since it was released, over a month ago I decided to go crazy and buy the whole range when I was in Boots. The Moisture Bomb Tissue Mask is a hydrating mask to revitalise dehydrated skin and add radiance, my skin felt plumped and significantly softer. It is enriched with pomegranate extract, hyaluronic acid and plant serum to help reduce fine lines and brighten complexions. The mask is easy to apply and you only need to keep it on for 15 minutes, I put it on whilst I was watching a film and before I knew it it was time to take it off. My skin was looking a bit down and this was the perfect pick me up, it looked way healthier afterwards and felt very fresh. I originally bought this as I wanted a lightweight cream whilst I was on holiday and as an added bonus I discovered it contains SPF 10. The 3-in-1 Day Cream softens, hydrates and reduces the appearance of fine lines, for radiant and healthier skin. The cream is easily rubbed into skin and provides instant hydration, leaving skin feeling and smelling fresh. I used it everyday whilst I was away in Marbella and my skin didn't at any point feel dry, especially considering the heat I was very impressed with the cream. You only need to apply a small amount as a little bit of cream goes a long way and is very good value for money. There is also a slight tint of the pomegranate scent and I love the refreshing fragrance I get every time I apply it to my skin. I have used so many different night creams over the years, but have never used a night gel-cream. I didn't even know gel-creams existed and was intrigued to say the least to see how well it performed. The texture is so lightweight that it melts instantly into your skin, there is no stickiness and is just as hydrating as a normal cream/moisturiser. Your skin regenerates over the night and is at its most prominent from 12am-4am, the Night Gel-Cream helps to repair skin at a cellular level and improves the quality of skin. Simply apply it at night and then just let it works its magic overnight, my skin feels so soft, plumped and revitalised in the morning. It is a slightly different texture to get used to but really good nonetheless!